WARSAW, Poland -- By the time U.S. Special Envoy for Climate Change Todd Stern finally left the plenary hall of the U.N. climate conference Saturday evening, he had been on his feet some 40 hours. Chinese lead negotiator Su Wei said his last bit of sleep had been Thursday. And Brazilian Ambassador José Antonio Marcondes de Carvalho said he needed some food. "It's not that I haven't had dinner; I haven't had lunch yesterday," Carvalho said. Double overtime has become the new normal for U.N. Conferences of the Parties (COP) to the U.N. Framework Convention on Climate Change, which are supposed to run for two weeks but often don't get down to the nitty-gritty until the final night. The result is a now-familiar scene for COP observers: delegates frantically changing their Friday flights to Sunday, activists curled up on the floor (or in the case of the Warsaw conference, on orange beanbags scattered through the soccer stadium venue) for a wink of sleep, and bleary-eyed diplomats wrangling over legalese at daybreak. 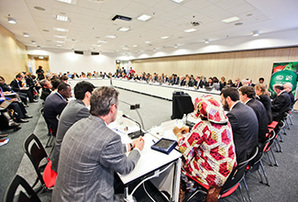 A strategy session at the U.N. climate conference in Warsaw, Poland. Some went on through the night. Photo courtesy of COP 19. Also now routine: the huddle. Two years ago at a conference in Durban, South Africa, it was dubbed "the huddle to save the planet," when Stern, European Commissioner for Climate Action Connie Hedegaard, Indian Environment Minister Jayanthi Natarajan and others hunched over a plenary table to hash out what would become an agreement to sign a new 2015 climate change treaty in Paris that will obligate all nations to cut greenhouse gas emissions. The Warsaw conference saw such a huddle over Durban language and yet another over compensation for poor countries. Both in the end produced a document that did not save the planet but offered vulnerable nations a new path for addressing the irrevocable losses associated with climate disasters and keeping countries on a track to the 2015 deal. "There are many ways to Paris that would be more beautiful and faster," Hedegaard said as the Warsaw talks finally drew to a close. But, she said, "If you look at what we in the E.U. came here to achieve, all these elements, we have them in the text. There is no backtracking from Durban." How did nearly 200 countries spend two weeks and 38 hours to arrive essentially where they began? The story begins the final Friday of the talks, which was, after the speechifying and posturing and arrival of ministers and more speechifying, when the real work really began. The three biggest items on the table by Friday evening were finance for poor countries, a new mechanism to help them address loss and damage associated with fiercer storms and rising seas, and the language charting a path to 2015. And the issues were interlocked with some countries holding out in one area for a deal in another. An early Friday draft text outlining plans for the 2015 deal was unacceptable to the American and other developed country diplomats who had fought hard two years earlier to insist that any future climate agreement be "applicable to all." By midnight, diplomats had already engaged in an hour-and-a-half-long huddle in one of the side meeting rooms in the massive soccer stadium where the talks were being held. Some countries, like Bolivia, Brazil and Russia, insisted on adding a reference to Article 4 of the U.N. climate convention or on adding other phrases like "common but differentiated responsibilities," often shortened in U.N. lingo to CBDR, and "under the Convention" -- both of which are codes for a system that wealthy countries are trying to make defunct in which they take legal emissions obligations and developing countries act voluntarily and in exchange for aid. "They're trying to put CBDR in everywhere they can get it," one developed country delegate said. "We're trying to hold the line." One new version was rejected by the United States because it called for a 2015 deal that was "applicable to all, under the Convention," which some saw as softening the call for broad participation. "This is the mind-numbing minutiae," said Nathaniel Keohane, vice president for international climate at the Environmental Defense Fund, standing in front of the meeting room close to midnight. Other fights overnight involved defining when countries would submit emissions targets and what they would look like -- particularly whether there would be some U.N. oversight to ensure ambition. The United States fought for the word "commitments," while major emerging powers wanted to call them "actions." By the time discussions closed, countries thought they had agreed to language that would "invite all parties to initiate preparations for intended nationally determined commitments" and to "communicate well in advance of [COP 21 in Paris], no later than the first quarter of 2015 for those in a position to do so." Meanwhile, in another meeting hall in another part of the stadium, other negotiators were haggling over the issue of "loss and damage." There was broad agreement on the importance of the issue by this point, but poor countries wanted a new, independent mechanism. Wealthy countries wanted it placed under an existing framework for helping nations adapt to the impacts of climate change. The difference sounds technical, but it really boiled down to money. Wealthy countries had promised to raise $100 billion by 2020 for two specific areas: adaptation and mitigation. They feared that creating an independent mechanism, or a "third pillar," as the United States described it, would lead to a call to deliver extra dollars. "They reached an agreement on the mechanism, but now the question is where to put it," said Wendel Trio of Climate Action Network Europe. "It took quite a while, but it's quite a compromise." Text on finance was also in a place where developed country diplomats thought they had agreement. Developing countries had wanted clear dollar-figure commitments of what wealthy countries would provide between now -- when they receive about $10 billion annually in climate aid -- and 2020, when the $100 billion is expected to flow. They were not going to get it. The late-night text was vague on numbers but did call for a clear pathway and urged an increase in maintaining a continuity of early spending levels with a view of increasing funds. In the middle of the night, meetings broke up so negotiators could take various draft texts back to their ministers. By dawn, there were rumors of a blowup. China and India were insisting on reinserting "Article 4" into the 2015 text. Smaller developing countries, unsatisfied with climate aid and fearing going home empty-handed, were demanding a $70 billion down payment on the $100 billion by 2016. "They're trying to reopen the deal they had in the huddle last night," said Alden Meyer, director of strategy and policy for the Union of Concerned Scientists. "We don't know what the endgame is." A 5 a.m. plenary meeting was rescheduled and then rescheduled again. When countries finally reconvened at 10 a.m. for an informal plenary discussion, things broke down quickly. The Fiji negotiator, speaking in his role as that year's head of the Group of 77 developing nations and China, said he was "frustrated" and "not encouraged" by the drafts. Bangladesh, speaking for the least-developed countries, called the overnight text "watered down." Then the first bomb dropped: Nicaragua made a play for the $70 billion, also calling for a new Green Climate Fund to be capitalized with $20 billion in funding. "We don't need an agreement on the Durban Platform in Warsaw," Nicaraguan Minister Paul Oquist Kelley told ClimateWire outside the plenary hall Saturday. He argued that talk on the new emissions treaty could wait another year or even two. Developing countries needed clarity on money. "Finance is urgent," he said. Then the second bomb: a demand for Article 4. In discussing the 2015 text, India's lead negotiator noted that for the first time, U.N. climate documents were making calls for all countries to take action and, he said, in doing so, they had to delineate that developed countries have more responsibility. "We would like very much to reiterate that as long as we have the word 'commitment' and 'applicable to all parties,' there is need for a specific context," he said. When the chair asked him about the language nations had all agreed to in the previous evening's huddle, the Indian negotiator replied, "A consensus in a huddle is not a consensus." Chinese Vice Minister Xie Zhenhua followed, saying "commitments should apply only to developed countries." Stern, speaking for the United States, said he thought that after the two-hour huddle, "we had landed somewhere pretty good." And he argued that the trickiest of questions --- how countries of different levels of development will tackle climate change -- won't be solved in Warsaw. But, he added, "It was somewhat astonishing to hear my good friend from China say commitments apply only to developed countries. I feel that I'm going into a time warp." Wael Hmaidan, head of Climate Action International, who was fasting in solidarity with the Philippines' lead negotiator, Naderev Saño, in honor of typhoon victims and for a strong Warsaw outcome, said he had been hoping to eat lunch. One European delegate feared a total breakdown. "I don't know how this whole thing ends. This is very worrying," the delegate said. Not involved in the attempt to reopen the 2015 text were island nations and the most vulnerable countries, which were pressing for wealthy developing nations to take on more responsibility. As he left the plenary hall, the Marshall Islands' minister, Tony de Brum, said, "I don't have enough cuss words to give you about what I think is going on here. "I think a lot of people are trying to be reasonable, and a lot of people are trying to monkey-wrench this," de Brum added. Of the previous night's huddle, he said, "I thought we had an understanding." Countries broke again for more informal talks, and sometime around 4 p.m., rumors circulated about a deal. Stern and Xie stood talking in the plenary hall and shook hands just as the chair called people back to their seats. The new language would "invite all parties to initiate or intensify domestic preparations for their nationally determined contributions, without prejudice to the legal nature of the contributions." They would be due for "parties ready to do so" by the first quarter of 2015. By 5 p.m., the Polish conference president, Marcin Korolec, declared the agreement "so decided." French Development Minister Pascal Canfin said the deal was "not ambitious." But, he said, "We've managed to save the process, which allows us to work to Paris." Delegates applauded. But then a new drama began over loss and damage. There was a plea for a 15-minute timeout from developing countries, which objected to describing the new mechanism as "under" the adaptation framework. Saño, the Philippines' lead negotiator, who had spent the conference fasting to press for a result that might shield other countries from the likes of Supertyphoon Haiyan, said that word would result in a "spiraling of distrust in this process." Hedegaard, agreeing to work something out, said, "It should not be that this word should stand between us." Nearly an hour later, the United States, Nicaragua, the Bahamas and Fiji brokered a deal that left loss and damage under adaptation for at least three years but also provided a review in 2016. "We can live with that," Nicaragua's Kelley said. Alf Willis of South Africa called the deal "fantastic" and praised the United States for trying to find compromise, adding, "I never dreamed we'd get a decision that strong." That suddenly unlocked other areas. The demand for $70 billion, which would have upended the entire discussion, as wealthy countries were adamant at not providing any specific dollars here, suddenly disappeared. Korolec gaveled in decision after decision to multiple rounds of applause. And in the end, like years past, ministers were satisfied enough to go home but still concerned. Albert Williams, lead negotiator for the tiny island of Vanuatu, said the U.N. talks don't seem to recognize the urgency of countries like his that already are experiencing relocation needs and need money to help build roads and other infrastructure to accommodate climate impacts. Said Williams, "It's really money that was needed yesterday." Hedegaard said now that the Warsaw drama is over, the real work of deciding what emissions pledges to bring to the table in 2015 begins. "Have a bit of a rest," she said. "But Monday, please start doing your homework." And at least some said the routine of pulling all-nighters at the climate talks needs to end. "I think in the near future, people are going to have to take that seriously. People get tense. We react to each other because we're tired. We're human," said Venezuelan Minister Claudia Salerno. "I don't think it's helping the problem."